Here you will learn about all the happenings at The Carriage House. Enjoy information on the current trends and more! Does Everyone Need to Match? As we all know weddings are straying away from being traditional. 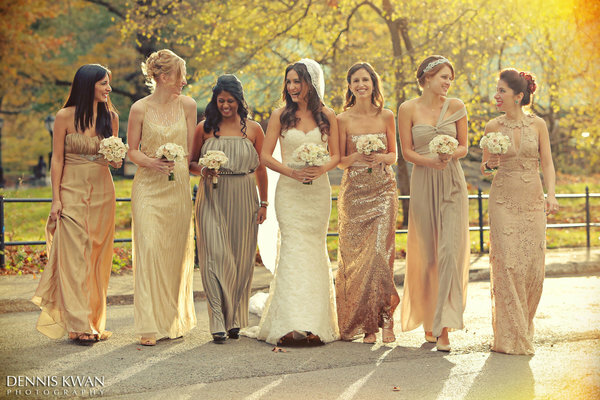 One of the biggest trends right now is having every bridesmaid in a different dress or different color dress. From the photos below you can see their are plenty of ways to express your style, theme, and color palette. This photo shows the bridesmaids in the same fabric & color, but the dress design is different. This allows for every bridesmaid to pick a dress that compliments their figure while still matching with everyone in the wedding party. This photo portrays all of the bridesmaids in completely different dresses, styles, & colors- yet they all work very nicely together. This again allows the bridesmaids to pick a dress that compliments their body type as well as their style. The bride had the bridesmaids keep with her theme and color palette while looking for the perfect dress. This bride did not have a particular color palette in mind when having the bridesmaids choose their dresses. She kept with the pastel tones, but every girl was able to pick a different color from the rainbow! Don't Forget to Enjoy the Journey of Planning! Picture Window theme. Theme images by davidf. Powered by Blogger.